Sachar, L. (1998). Holes. New York, NY: Dell Yearling. Stanley Yelnats, and all of the Yelnats men have the worst of luck due to a curse, or so they think, as a result of his “no-good-dirty-rotten-pig-stealing-great-great-grandfather”. Regardless of whether you do or don’t believe in superstitions, Stanley (last name spelled backwards) finds himself in court blamed and falsely accused for stealing a pair of sneakers. He is sentenced to Camp Green Lake, a desert, where he all the “troubled” boys dig 5’x5’ holes daily. Why? To build character, or that’s what they’re led to believe. Warden is actually using the boys to search for a treasure she has been searching for her whole life (her father made her dig holes when she was little). When Zero runs away and Stanley follows him soon after, they manage to survive the rattlesnake and yellow-spotted lizard infested desert to a hidden oasis and survive by eating only onions. In the meantime, one of Stanely’s father’s failed inventions hit big and they hire a lawyer who appeals Stanley’s charges and is found innocent. When they choose to return back to camp they discover the treasure Warden has been so desperately searching for, a trunk with the name “Yelnats” on it, and enough riches inside to make Stanley, his family, and his new best friend who he reunited with his mother that abandoned him. Stanley and Zero’s families are connected back to the great-great-grandfather Yelnats. 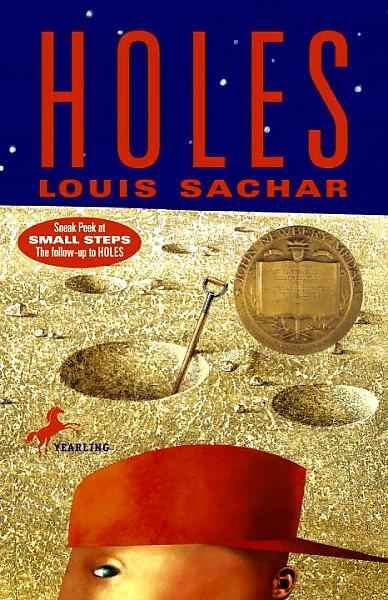 Louis Sachar does a wonderful job incorporating the topic of bullying in Holes as one if its major themes. The reader learns that bullying can be overlooked and often not taken seriously. The Warden bullies both Mr. Pendanski and Mr. Sir by her constant insults and threats. Mr. Pendanski is observed bullying Zero on many occasions referring to him as stupid or worthless because of his inability to read. Stanley is also bullied at Camp Green Lake by both Mr. Sir and other boys (Zigzag and X-ray) in his group. Holes introduces a concern as a result of bullying as seen when Stanley begins to feel more accepted by his camp mates and starts meditating revenge fantasies on those who had bullied him. Holes is a fun adventurous treasure hunting story. The major motion picture, Holes proved successful as well with very minimal differences from Sachar’s novel. All of the boys have creative nicknames, specific to their internal or external characteristics, such as Zero, Zigzag, X-ray, Magnet, and Armpit. And though the boys are treated appallingly, spoken to abusively and bullied, Holes is chalk filled with humor, likeable character,s and interesting unexpected encounters with others that have crossed paths with his great-great-grandfather Yelnats. This is a book worthy of introducing topics such as; troubled kids, bullying, assumptions and misunderstanding as also addressed in both the Journal of a Schoolyard Bully: Cyberbully by Farley Katz and The Misfits by James Howe.